Fort Macleod residents and visitors have two opportunities each week to do their marketing. 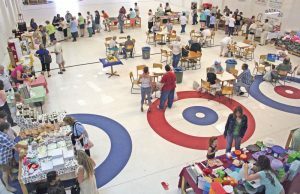 The Busy B’s Farmer’s Market operated by the Fort Macleod Lions Club will run from 4-8 p.m. Wednesdays at the Fort Macleod Curling Club. People can gather around small tables when the market opens to enjoy refreshments and swap stories, while others shop at the Farmer’s Market tables. Vendors at the Busy B’s Farmer’s Market offer fresh produce, baked goods, preserves, antique jewellery, clothing and paintings and a variety of other goods. The second opportunity throughout the summer happens on Thursday evenings with the Main Street Market in the downtown core. The outdoor market started last summer and attracts a number of vendors each week selling a variety of homemade goods, produce and other items. Organizers also arrange entertainment each week. The market runs from 5-8 p.m. Thursdays.